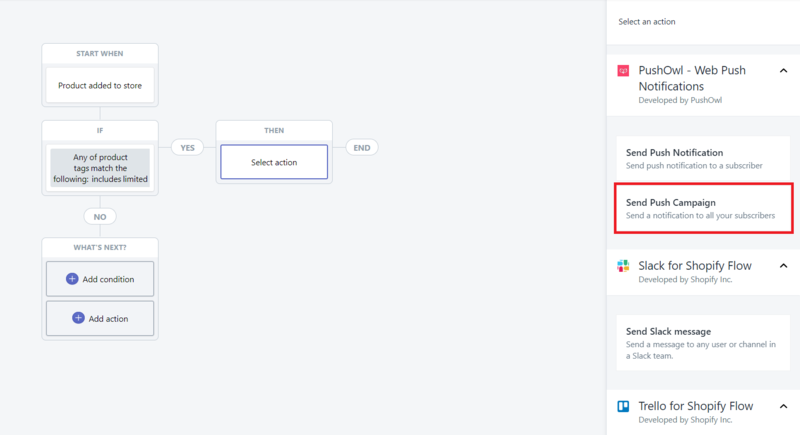 Set up automated push notifications with Shopify Flow to update customers about a high demand product. 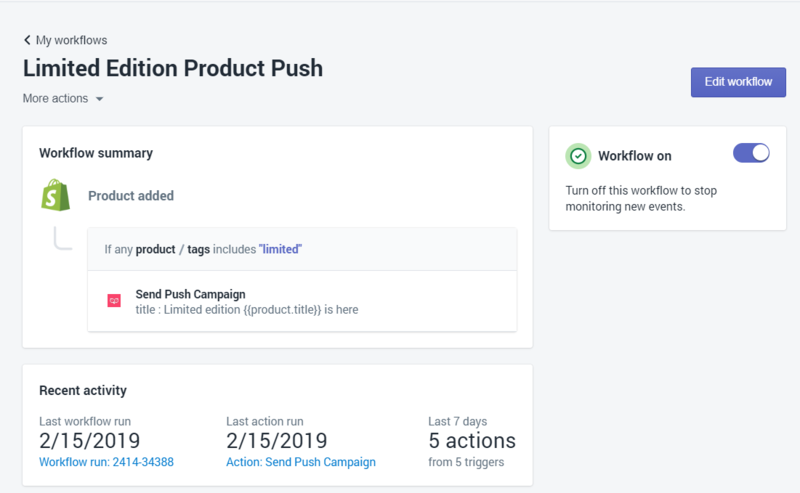 Instead of going through the process of creating a new push campaign every time you launch a high demand product, set up an automated workflow to make Shopify Flow do it for you! With this workflow, customers will receive a notification the minute you update your inventory with a high demand product, simplifying your process and keeping your customers informed. Let's see how you can set this up. 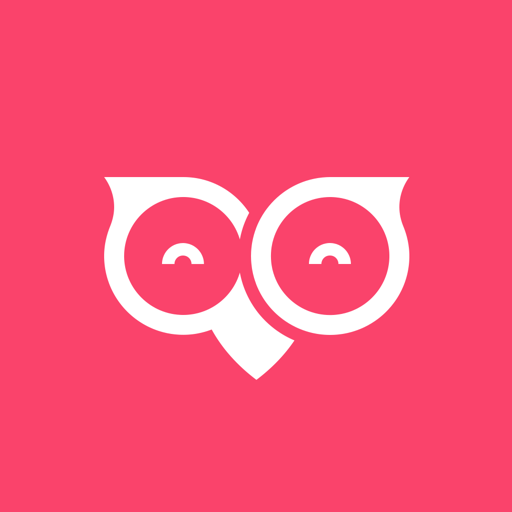 This workflow aims to send an automated push notifications for limited edition products. You can change the term accordingly within the workflow. 4. Select ‘Add Condition’ and click ‘Tags’ from the first dropdown. 5. In the second dropdown, click on ‘'Any of product tags match the following' from the options. 6. Click on ‘includes’ from the third dropdown. 7. In the text box, write ‘limited’ as the tag. You can change this tag accordingly. 9. A sidebar will appear on the right. Scroll down to find ‘Send Push Campaign’. 11. 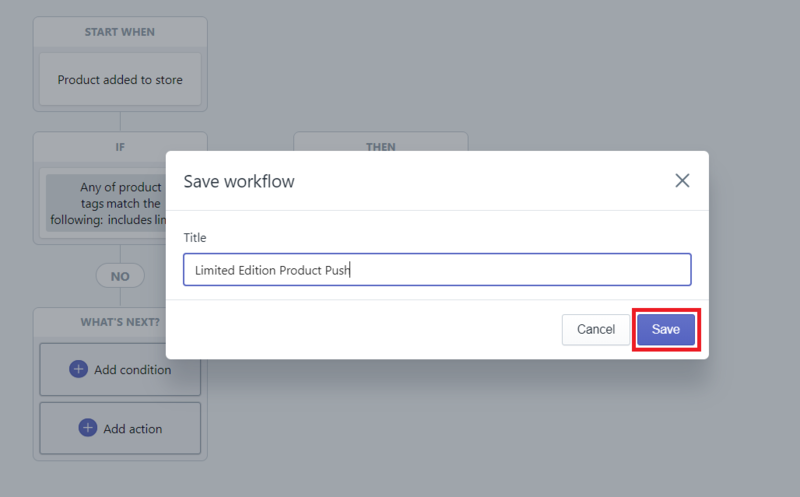 Name the workflow ‘Limited Edition Product Push’ and click ‘ Save’. 12. Click on the switch at the top right to enable the automation.